Apolipoprotein CII (apoCII) is a protein found in large fat particles that the gastrointestinal tract absorbs. It is also found in very low density lipoprotein (VLDL), which is made up of mostly triglycerides (a type of fat in your blood). This article discusses the test used to check for apoCII in a sample of your blood. You may be told not to eat or drink anything for 4 to 6 hours before the test. 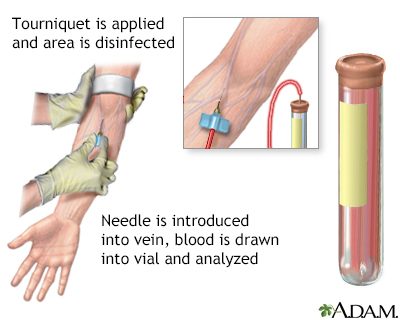 When the needle is inserted to draw blood, you may feel some pain, or only a prick or stinging. Afterward, there may be some throbbing where the needle was inserted. ApoCII measurements can help determine the type or cause of high blood fats. It is not clear whether the test results improve treatment. Because of this, most health insurance companies will not pay for the test. If you DO NOT have high cholesterol or heart disease or a family history of these conditions, this test may not be recommended for you. The normal range is 3 to 5 mg/dL. However, apoCII results are usually reported as present or absent. High levels of apoCII may be due to a family history of lipoprotein lipase deficiency. This is a condition in which the body does not break down fats normally. ApoCII levels are also seen in people with a rare condition called familial apoprotein CII deficiency. This causes chylomicronemia syndrome, another condition in which the body does not break down fats normally. Apolipoprotein measurements may provide more detail about your risk for heart disease, but the added value of this test beyond a lipid panel is unknown. Genest J, Libby P. Lipoprotein disorders and cardiovascular disease. In: Zipes DP, Libby P, Bonow RO, Mann DL, Tomaselli GF, Braunwald E, eds. Braunwald's Heart Disease: A Textbook of Cardiovascular Medicine. 11th ed. Philadelphia, PA: Elsevier Saunders; 2018:chap 48. Remaley AT, Dayspring TD, Warnick GR. Lipids, lipoproteins, apolipoproteins, and other cardiovascular risk factors. In: Rifai N, ed. Tietz Textbook of Clinical Chemistry and Molecular Diagnostics. 6th ed. St Louis, MO: Elsevier; 2018:chap 34.